The Best AC in America! The H.V.A.C experts specializing in all aspects of climate, refrigeration and process cooling control. 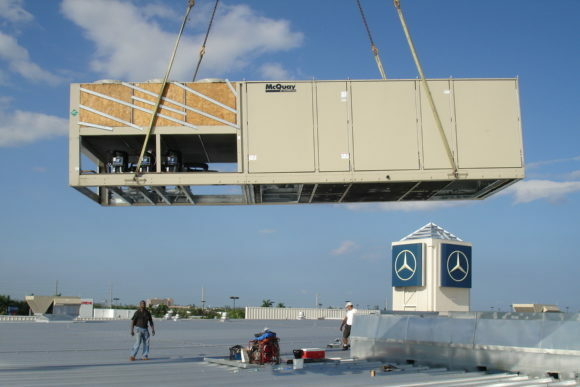 American HVAC performs installations both large and small. If it is a centrifugal chiller or a small refrigeration system we will perform our work in a professional and dependable manner. When it comes to an emergency repair or replacing a broken system, we will have your system up and running in a cost effective and timely manner. We believe in job quality which means all installations will be done neatly and correctly. We treat your equipment as if we owned it, and we were personally responsible for it. We carry the belief that a quality repair will be the most economical for our customers. Our expertise in commercial system applications makes us the most relied on company in the H.V.A.C.R field. Whether the task is cooling down a small mechanical room or a multi million dollar computer server room in an office building or a process cooling plant, our knowledge and experience grants us the opportunity to give 100% customer satisfaction. From low temperature designs such as cascade systems to high efficiency systems, energy management systems, office buildings, environmentally controlled storage or general retail. American HVAC has access to over thousands of quality products ready to satisfy any H.V.A.C.R problem. We replace and install all makes and models and provide all warrantees available from the manufacturers. With the extensive background in our field we have the capability of completing any project with the reliability and quality necessary to provide a system that will be dependable for many years to come. American HVAC, Inc. is a forward looking commercial air conditioning company with an eye on innovation. Our background in energy efficiency and experience partnering with energy management companies ensures successful commissioning on every project. Our knowledge base allows us to succeed on commercial A/C systems in any setting and any size, including commercial office, industrial process and retail solutions. American HVAC takes an especially hard look at all systems it services during periodic maintenance when it comes to air quality and efficient operation. When called upon in critical or re-occurring situations by potentially new customers our problem solving skills linked with our depth of experience will foster a confidence that will ensure a new professional relationship. We can provide a summary survey of your equipment that will grade the present level of service you are getting from your current HVACR company. This evaluation will give an insight to make a decision on current or future service.